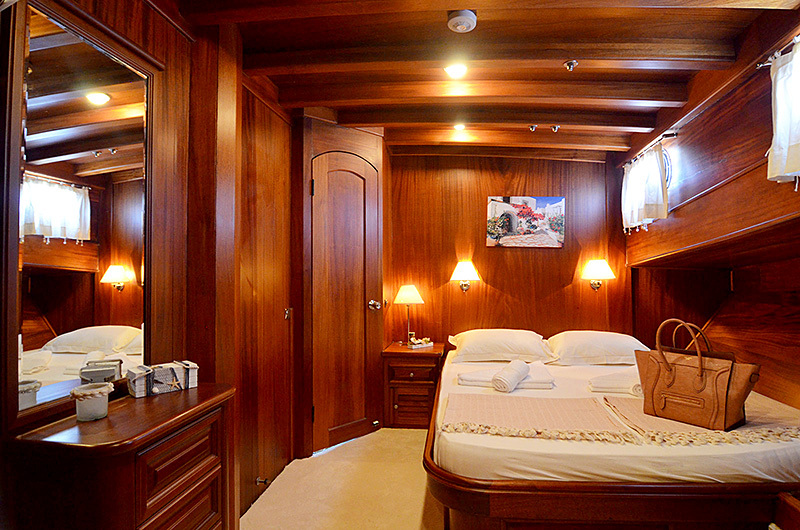 Going on board of M/S SMYRNA you immediately feel the beauty of this charming combination of old style wooden Gulet lines and modern fresh design. 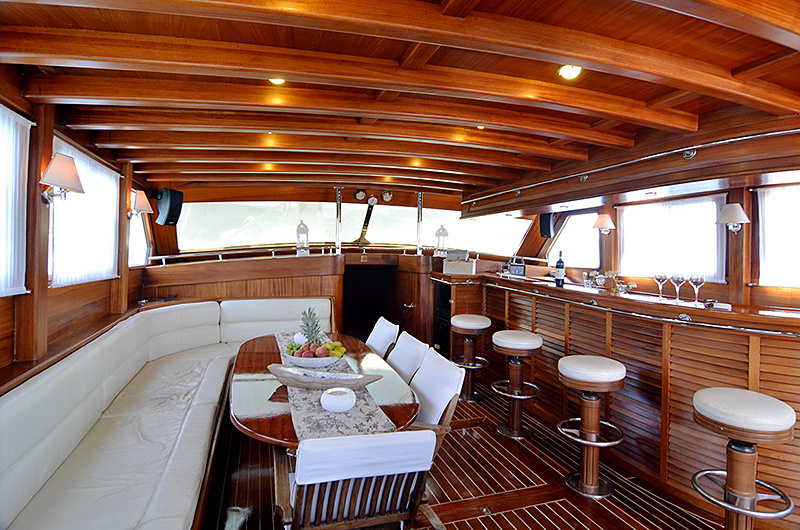 Captain Oktay has put a lot of thought into refitting his Bodrum built yacht. The result is remarkable. M/S SMYRNA now appears as an upper class lady. 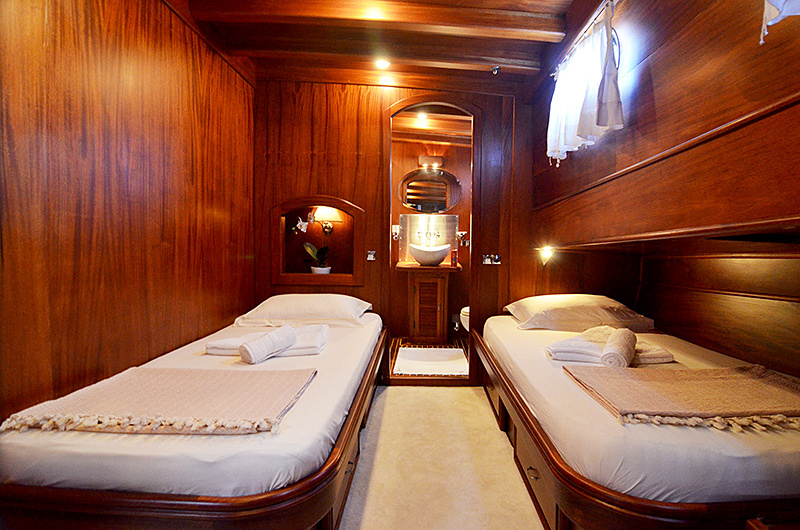 2 beautiful and spacy double bed cabins and 2 twin bed cabins will provide you with luxury accommodations. It is ideal for two couples with children or groups up to 8 people. 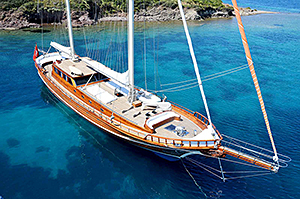 While cruising the clear waters of the Aegean Sea you will be spoiled by a 4 person crew – Captain, cook, sails man and deckhand. M/S SMYRNA and Captain Oktay together present you with a "Blue Voyage" along Turkey's Aegean and Mediterranean shores for periods of your own choosing. 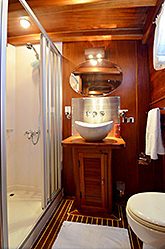 A private "Blue Voyage" for your own group. The cruise route, bays, villages and townships, and archaeological ruins to be visited will be determined based on your preference. Each detail will be planned according to your wishes to give you a vacation perfectly tailored for you and your group. If you wish, M/S SMYRNA will stop her engines and with her sails fully stretched by wind, silently cruise as you listen to the sea. You will be able to change the cruise schedule at will and drop anchor wherever you please for as long as you wish. All services will be provided on board by the crew. Meals and snacks will be provided according to your wishes. It will be a Blue Cruise entirely focused on your desires, recreation and well being. Read a book, or just enjoy the silence and beauty of these wonderful Turkish bays. 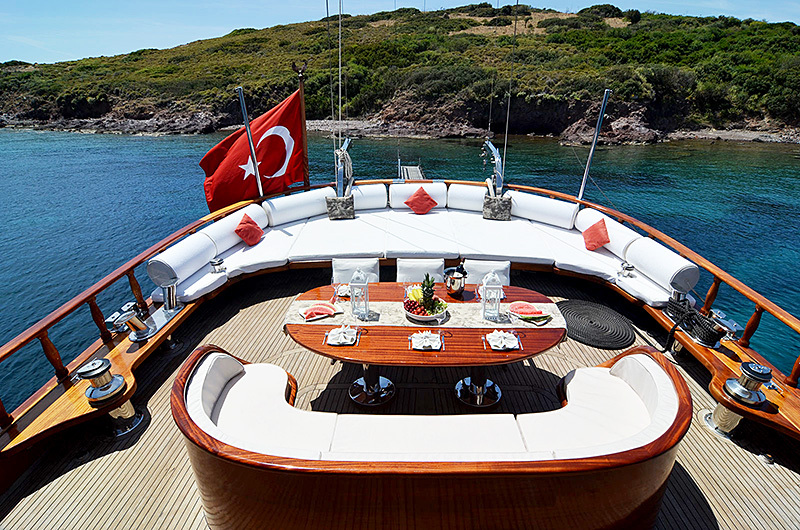 View rich historical places nearby - Captain Oktay knows them all. He says, "Anyone who embarks on my boat, no matter from which part of the world, deserves the best of everything". We also offer to arrange and take care of your airport transfers.